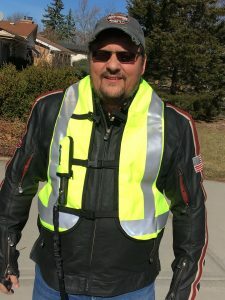 coolcycledude.com | Motorcycle conversation and a whole lot more! The 2018 Harley Davidson Fat Boy looked pretty damn cool from where I was sitting. But, it’s not the motorcycle for me. Not a fan of solid rims, big front tires, or that satin look where chrome should be. I can take or leave the speedometer. On second thought, I’m going to leave it. 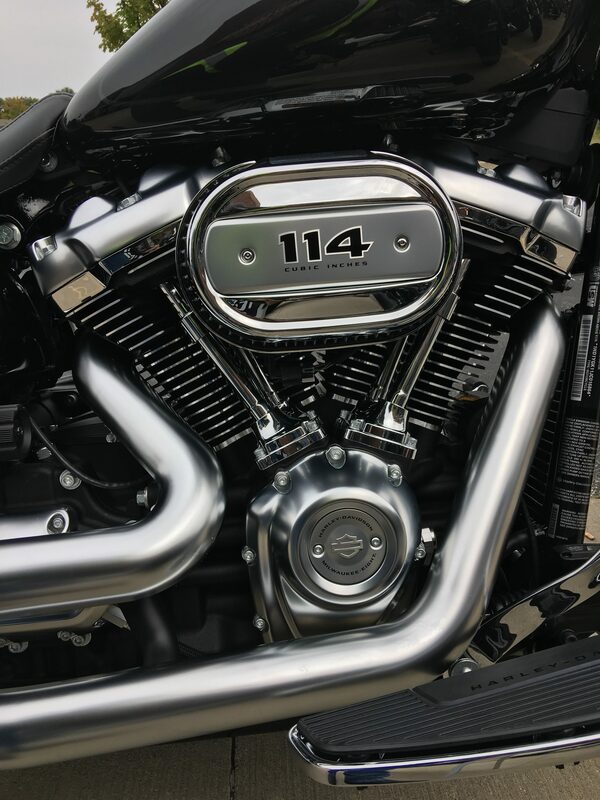 A 114 cubic inch engine! That’s three cubic inches bigger than Indian’s Thunder Stroke 111 engine, for those of you who are good at math. Ruh-roh for Indian. The new 114 Milwaukee-Eight engine has oil circulating around the exhaust valves. Trying to increase rider comfort and improve engine performance. Moto Guzzi has been doing that gig for a while. I predict it will be very warm to hot as hell between the rider’s legs. Nomex underwear will need to be on the H-D dealers’ shelves soon. Don’t worry, they’ll have the bar and shield on them. Okay, time to talk about the frame and suspension. 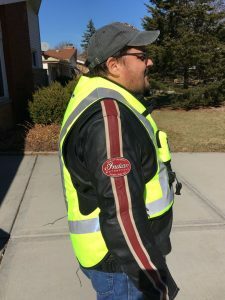 H-D has hit a home run out of the park baby! The frame has fewer parts and welds needed to assemble it, making it stiffer and lighter. The new engine is now directly bolted to the frame. The rear suspension has been redesigned for better leverage and more travel. The front forks have been modified to compete with the rear suspension. 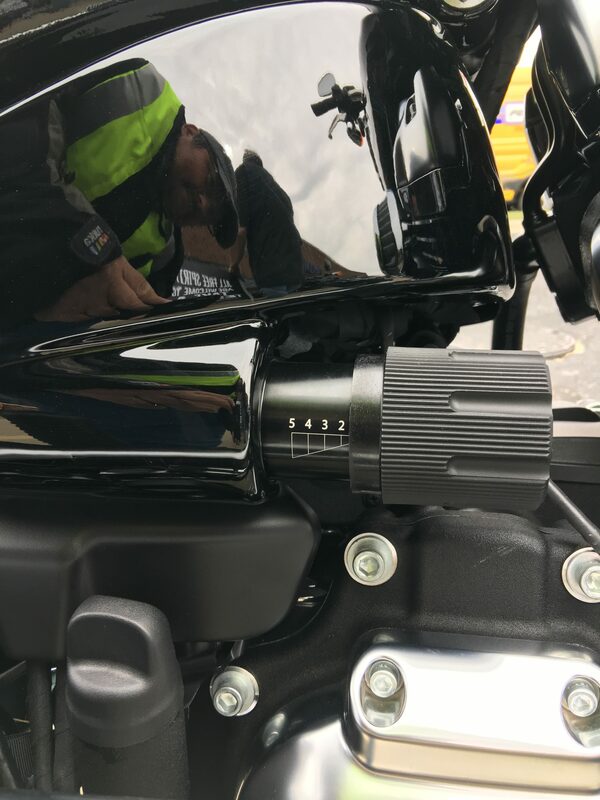 The preload for the rear shock is now accessible for adjustment. I’m not happy with some of the exposed wiring and cabling on the motorcycle. I think it should have been tucked away somewhere. The oil dipstick/fill is an upgraded design. It appears to be very accessible. The fit and finish is damn close to 90%. There’s one part on the lower back of the frame that looks like I casted it high school. Then I painted it so my teacher wouldn’t see my screw up. I’m really glad H-D has stepped up with LED lighting. 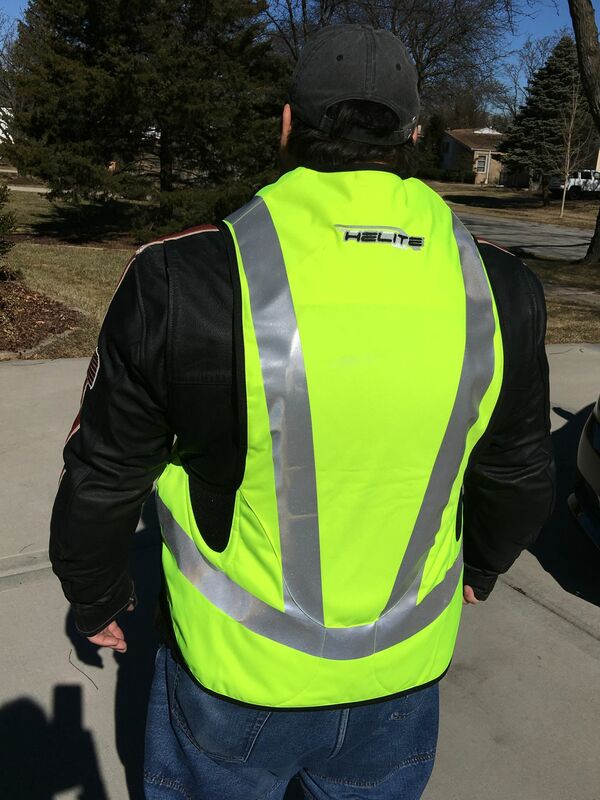 I’ve have two motorcycles with LED lighting and it makes a big difference. I consider LED Lighting a safety feature and not just some new-fangled gizmo. 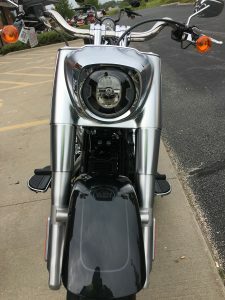 I’m not sure about the new headlight design yet, but it’s growing on me each time I look at it. 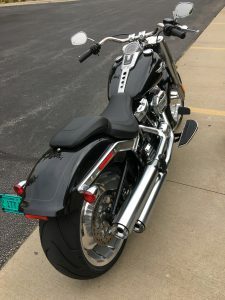 I think H-D has scored big time with the changes they’ve made to the Softail frame. 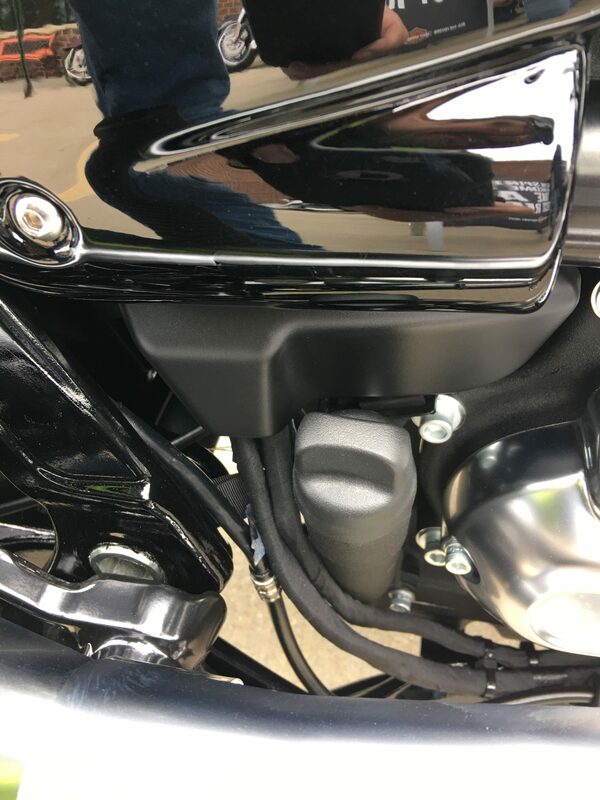 They really needed to improve rider comfort on the Softail models. 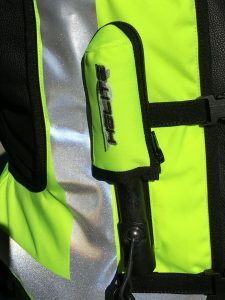 Streamlining the assembly process and improving the overall functionality of the frame will enhance H-D’s ability to compete in the market place. The LED lighting shows a commitment to modernization. There’s definitely some design departures on this Fat Boy that the H-D faithful might not like. But as far as I’m concerned, they’re welcome changes. I doubt that I will ever ride this motorcycle, just not my gig. But I know someone else will. I hope H-D hits the bullseye with this model. My Moto Guzzi is four years old! 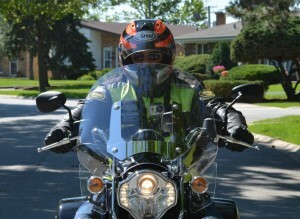 I am entering my fourth year with my Moto Guzzi. Drumroll, please. Yup, four rotations around the sun. I don’t know how many dog years that is either. Somewhere around 6,500 miles on the digital odometer, or clock as they call it across the pond. On its second set of tires. This motorcycle is probably one of my all-time favorites in my 45+ years of riding motorcycles. 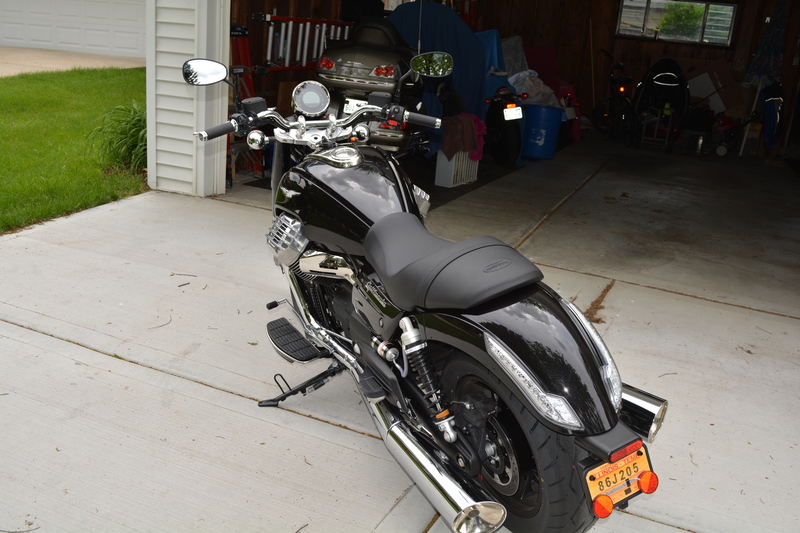 I bought this motorcycle in June of 2013. I went to a Moto Guzzi dealer that is about 45 miles northwest from our home. This motorcycle actually started out as a California 1400 Custom. 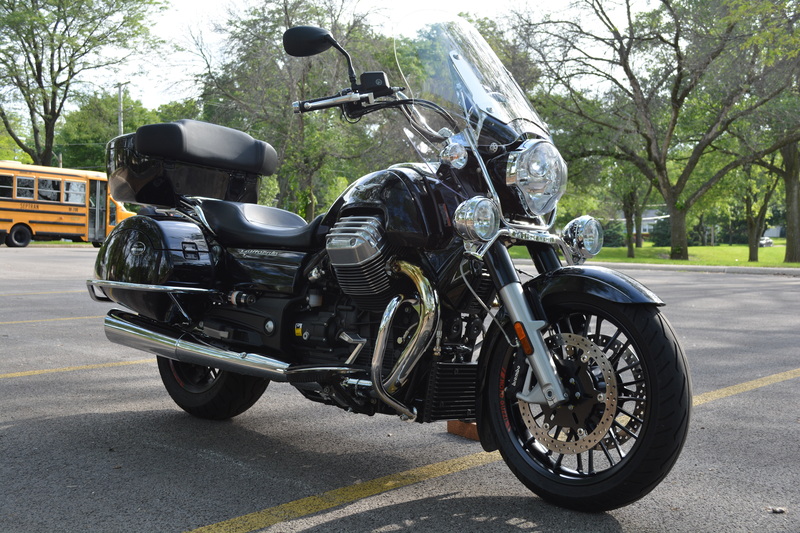 Moto Guzzi has since dropped the California 1400 Custom from the lineup. The California 1400 Custom was touted as the Italian V-Max. Referring to Yamaha’s V-Max, I owned a red 2010 Yamaha V-Max. The Yamaha V- Max would blow by the California 1400 Custom like hurricane. But it was nice marketing ploy. In my great wisdom, I decided not to get the touring model. I thought to myself, the touring model is just too damn expensive. 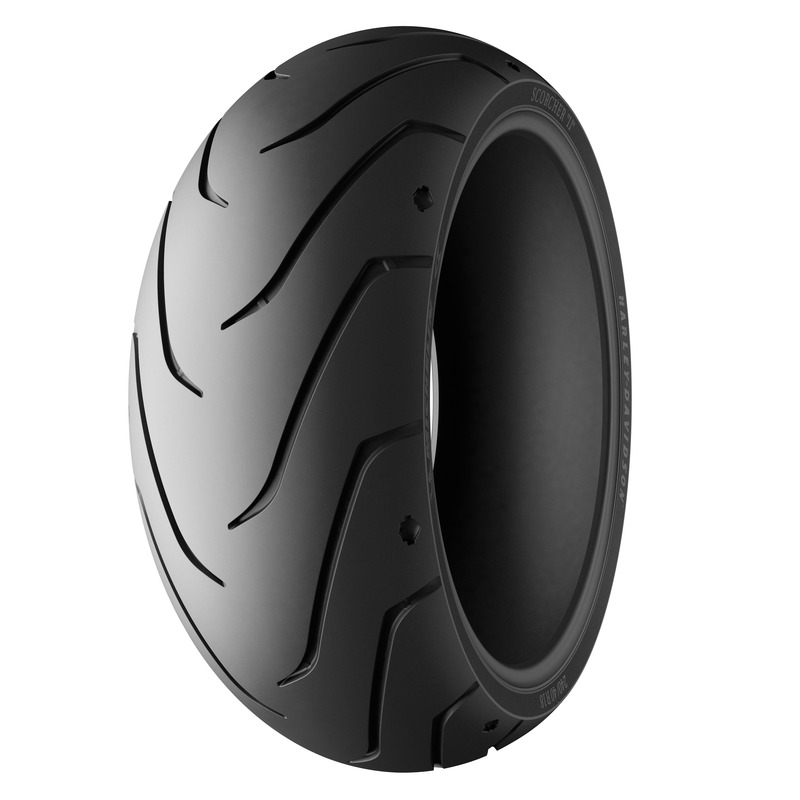 No way is Moto Guzzi going to get this kind of money out of me. 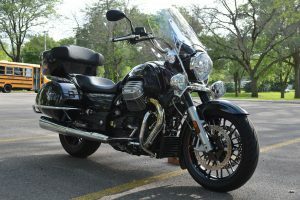 Plus, I’ve already got a Honda Goldwing if I desired to go on any long trips. Perfect logical, critical thinking that any Vulcan would have been proud of. I bought the Moto Guzzi for short hops, back and forth to wherever. Day five of ownership, I drove it across the state of Illinois. Roughly 250 miles from our home to Iowa and back. 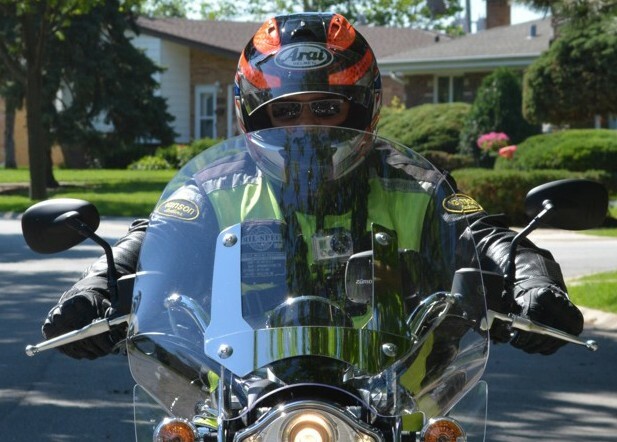 As I pulled in our driveway, I already had a list of changes in my head to make to the motorcycles. One of changes was driven by pain in my shoulders. Top priority, the handlebars have got to go. Hasta la vista, baby! Italians must have longer arms than me. 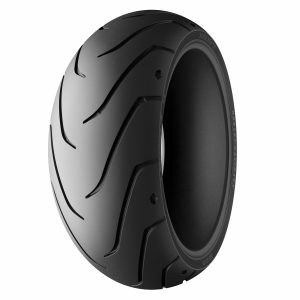 Went right to af1racing.com and I started perusing the Moto Guzzi area for available parts. As I scrolled through the page, I came across touring handlebars for that model. Click! Next up was the windshield and mounting bracket. Another two clicks! As I further scrolled down the page, hey, this passing light looks cool. Click! Damn, they’re not LEDs like on my Harley Davidson. Unclick! Okay, whatever, they still look way cool. Click! Mounting brackets? Nope. Off to the checkout part of the page. Entered all of my data and hit the checkout button. My iPhone immediately buzzed from a confirmation email. 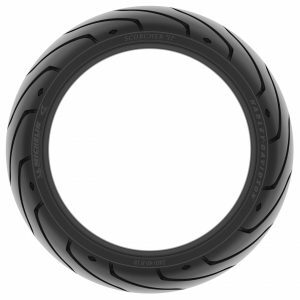 All good now, 10 to 15 days to wait for the delivery of my Moto Guzzi parts. About a week goes by and I’m back on af1racing.com. More perusing in the Moto Guzzi area for available parts. Hmm, look at all of these parts. 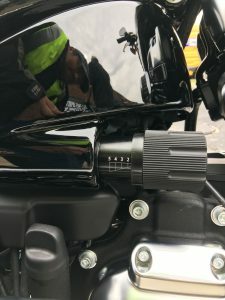 Hard saddlebags, brackets, and saddlebag guards. Click! 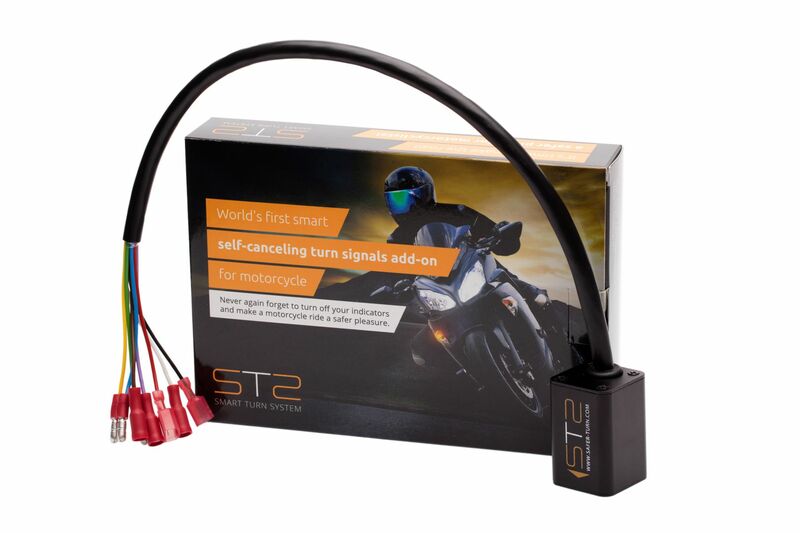 Heated grips? Got them on the Honda and Harley. Click! Engine guards. No brainer. Click! A hard trunk with a very cool Moto Guzzi emblem on the back of it, same color as the saddlebags? Click! Ruh-roh, trunk bracket required. Click! Leather seat? Click! 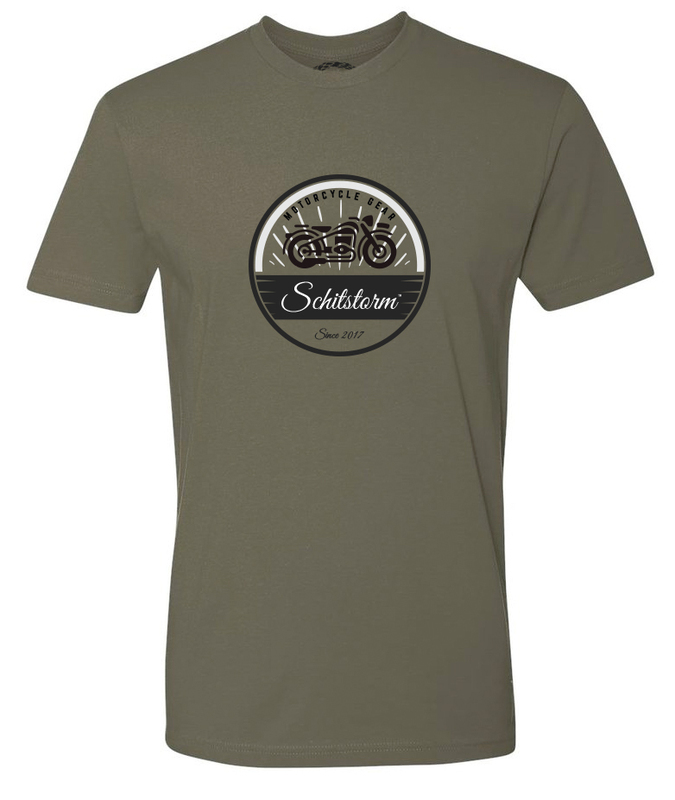 Hit the checkout button, once again, an immediate buzz on the iPhone. Okay, now it dawns on me that I should have bought the touring model instead. Well, good decisions are sometimes elusive from the human thought process. But, now it’s time for a good decision. 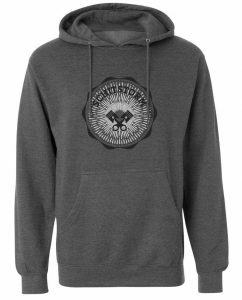 I contact the vendor and asked if I could change the shipping address. Good news, nothing had shipped yet. Changed the shipping address to the dealership where I bought it. Sent the dealer an email to forewarn them of the upcoming deliveries of parts and a request to get all of this stuff installed. They were on board with this gig. But they told me I needed to change the brake and clutch lines to accommodate the new handlebars. Yup, more parts. 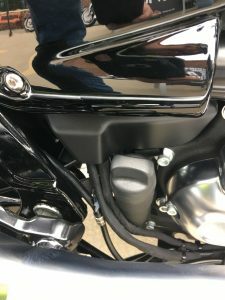 Five weeks from my first click on the vendor’s website, I was riding around on my converted California 1400 Custom. Well I got something in the mail today which was way cool. 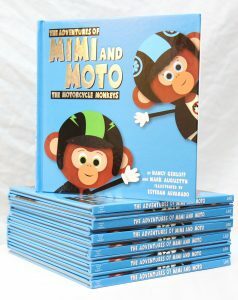 Very creative little book called The Adventures of Mimi and Moto the Motorcycle Monkeys. Yup, motorcycle monkeys. Its direct application is to get the little tykes involved in motorcycling using a Disney-like genre. This book is approximately 20 odd pages. So, if you’re looking for something along the lines of War and Peace, you’re out of luck. But if you’re looking for a really cool book to read to your children, nieces, nephews, grandkids and anyone under the age of five in your close vicinity, this is definitely the book you want to have in your hand. This book is a children’s motorcycle picture book that will inspire future participants in the motorcycle industry. No “See Spot Run” in this book. Do they even have “See Spot Run” books in schools anymore? Let’s get back on track. 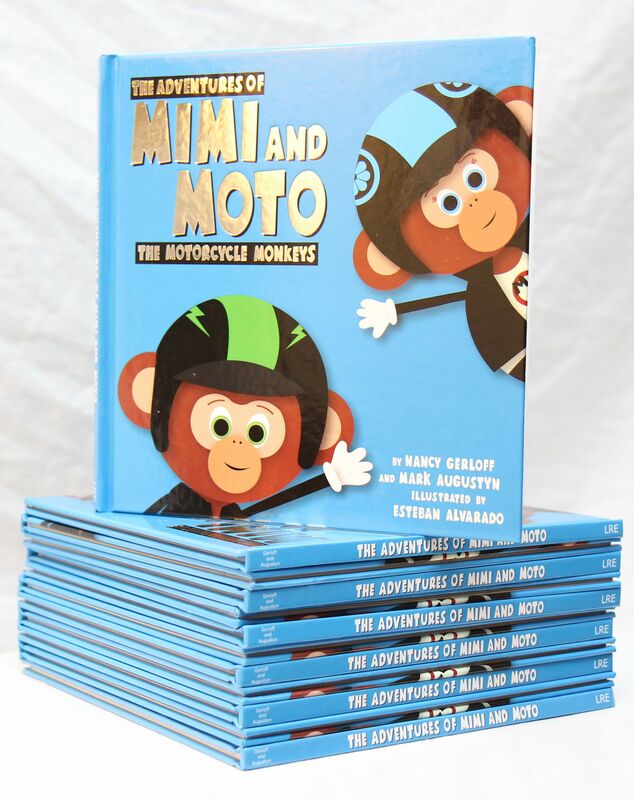 The illustrations in this book will spark a child’s imagination while teaching him or her motorcycle safety. It also teaches about camaraderie with your mates on the open road. This is definitely a book that a child would treasure. This book is 100% coolcycledude approved! Ruh-Roh!!! It looks like Polaris industries has kicked the Victory motorcycle brand to the curb, ouch. Polaris plans to wind down their manufacturing facility for the Victory motorcycle in the next few weeks. This is a big blow to the owners of Victory motorcycles and definitely a tragic event for those who were employed bringing the brand to market. Polaris will provide parts and service for the next 10 years per what I read in their press release. I kinda get the parts thing because I think it’s a federal law that they are required to manufacture repair parts. But I’m kind of curious how many dealers will continue to service a product that they no longer sell. There is no federal law forcing prior dealers to honor the verbiage in Polaris press release. I don’t want to be one of those people who say I saw this coming. But I can’t control myself, so I guess, I’m going to be one of them. 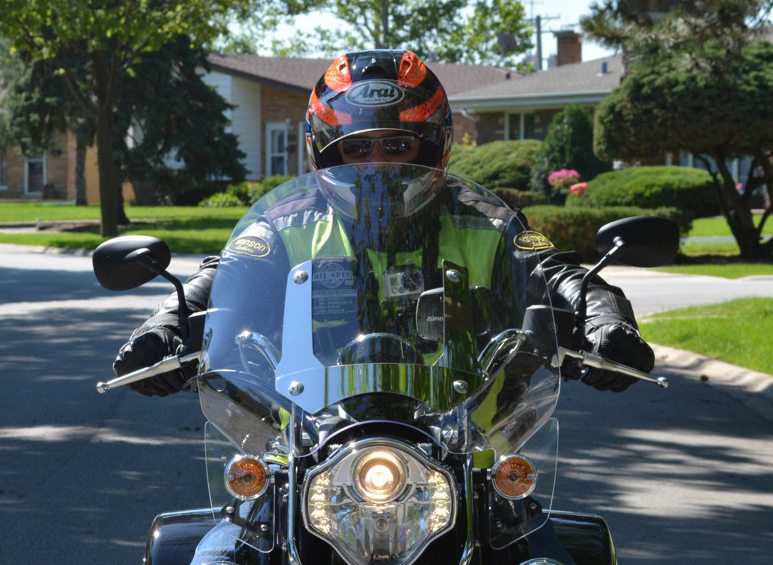 I’ve ridden several Victory motorcycles at various demo rides over the years. I really like the product, but I noticed there was never any substantial changes to make the product more marketable. Polaris would change the paint jobs, add bigger stereo systems, change the size of the front wheel and incorporate LED lighting. But, no major R&D investment. Polaris has also brought a competing product to market when they resurrected the Indian motorcycle brand. I’ve read where Polaris thinks that the Indian brand is a better rival to reduce Harley Davidson’s market share. This particular market segment is a battleground of epic proportion. Many other motorcycle manufacturers have fallen due to Harley Davidson’s dominance. A shrinking demographics doesn’t help the situation either. I’m no expert with stocks and bonds, but it looks like Polaris industries stock has been sliding in the wrong direction. I’m going to guess this was another of the driving forces to shut down the production of the Victory motorcycle. The CEO of Polaris has a responsibility to the board of directors and the stockholders. So, in the end it’s really not a tough decision to make. Although, if Polaris industries needed money why didn’t they sell the Victory brand. It’s already established, they already have a dealer network and a loyal following. Sounds like a really good idea to sell the Victory brand. I guess they just don’t want another brand competing with their Indian motorcycle brand. Over 500 show vehicles will compete for awards within the Fairplex buildings during the three-day show January 29 – 31. Another 400 – 800 vehicles will join the event over the weekend for the 11th Annual Grand Daddy Drive-In event. “I’ve always had a passion for land speed racing. Competing on the Salt Flats of Utah and dry lakebeds of California as an independent racer always reminds me of the unsung heroes who made American racing what it is today. This special invitation to appear at the most prestigious rod show just blows me away,” said Thompson. 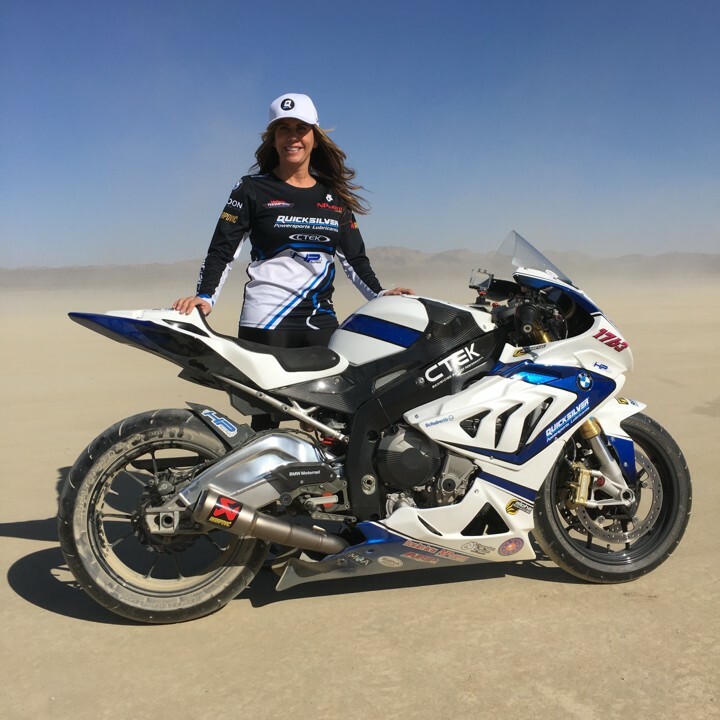 “More importantly, this exhibit will be used as a fund raiser for the SCTA, a non-profit organization that makes racing dreams possible for all competitors, no matter the size of their pocket book,” added Thompson. The Grand National Roadster show will be held at the Fairplex in Pomona January 29 – 31, located at 1101 W. McKinley Avenue. For schedule updates and tickets, visit https://www.rodshows.com/gnrs/index. The GNRS is now in its 67th year. Once known as the Oakland Roadster Show, it is the longest running indoor car show in the world. This will be the 13th consecutive year the show has been produced at the Pomona Fairplex.